Pictured, Back row (L-R): Greg Gallo, Big Deal; Dale Bobo, Big Deal; Bradley Collins, BMI. Front row (L-R): Pete Robinson, Big Deal; Ross Lipsey, writer; Noah McPike, attorney, Almon/McPike. 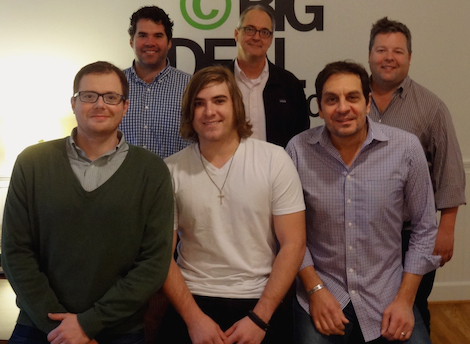 Ross Lipsey has signed an exclusive publishing deal with Big Deal Music. “Ross is a tremendous artist, singer, and songwriter,” says Pete Robinson, GM/Senior VP of Big Deal Music. “We’re honored and thrilled to have a talent like Ross on the Big Deal team,” mentioned Greg Gallo, Sr. Director of Creative. Originally from Monterey, Louisiana, Lipsey moved to Nashville last year after graduating from the University of Louisiana at Monroe.